Joining a little over one year ago, the Jonas Brothers' official YouTube channel has close to 187,000 subscribers, over 8,064,500 channel views, is the number one must subscribed musician and the 6th most subscribed of all time. With currently 48 videos, their most viewed one (their "S.O.S." music video) counts in at roughly 26,474,000 views, followed by the official "When You Look Me in the Eyes" video at close to 19,000,000. Their most recent music video, "Burnin' Up" hit 5,500,000 in the first week. The least viewed video on the Jonas Brothers' channel is titled "Jonas Brothers concert Texas" at 91,900. Known for their usual randomness, their non-music video content is widely watched by all sorts of YouTube viewers, the most popular being "The Nick Jonas Show," a mock talk show hosted by Nick Jonas himself with usual special guest Joe Jonas and Kevin Jonas on the camera. Other videos include their youngest brothers pretending to play guitar in "Frankie Trashing," a short video of Joe crossing his eyes in "Joes Spare Time," a glimpse of their tour with the sister singing duo Aly and AJ entitled "aly and aj tour 06" and dubbed videos of a biblical cartoon show called "The Greatest Adventure." You can see all of those and more here. 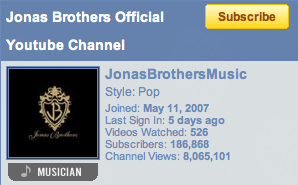 From time to time the Jonas Brothers' Official Channel background is changed to provide a fresh, new channel look. Most recently, the whole channel was renovated to go with the theme of their new single "Burnin' Up."